My wife is a serious spin nut. She’s been working out at CycleBar every week for about two years. But I kept hearing more and more about this new studio called Flywheel that’s apparently all the rage, so I sent her to check it out. 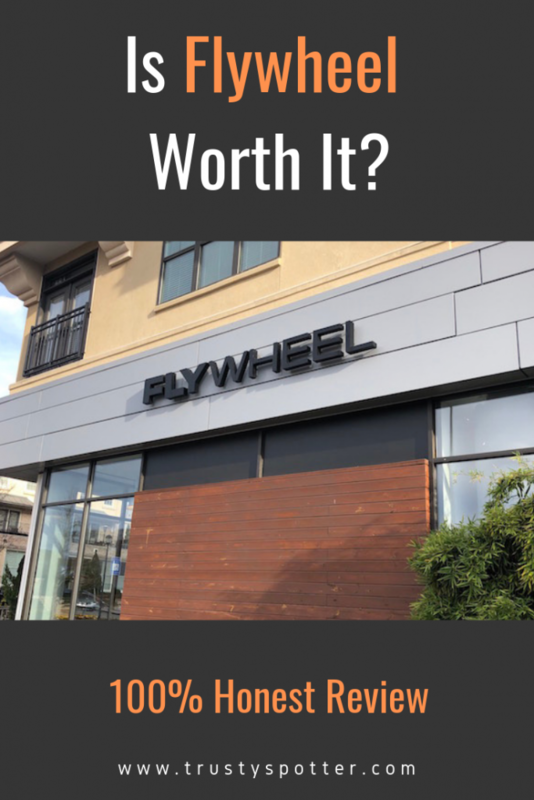 If you’re wondering what a Flywheel class is like, how much it costs, and if it’s worth checking out, here’s our 100% honest Flywheel spin class review! Overall, the studio near us had impressive size and amenities, but the bikes weren’t great and it definitely had a “big chain” vibe. It’s also a bit pricier than some other spin studios, although if you get an unlimited spin/barre package, that ends up being a great deal. Now let’s dive into a few more specifics. Is Flywheel right for you? If you’re thinking about giving this a try, but you’re not sure if it’s right for you or if it’s worth the money, here’s exactly what you’re in for. 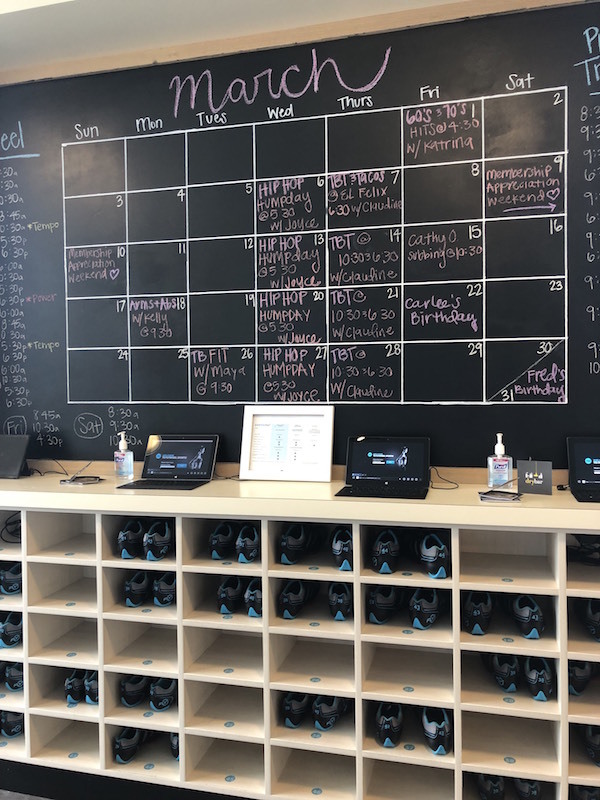 One thing that’s great about Flywheel is that you book your class (and bike) ahead of time on their mobile app or on the website, both of which are super easy to use. That means you’re guaranteed a spot (unlike walk-in studios or classes held at big box gyms), and you can choose whatever available bike you want. Grab one at the front or hide away in the back, it’s all good! How should you prepare for a Flywheel class? Other than booking, there’s not much to do. Wear some comfortable and breathable athletic gear and socks. Definitely don’t wear baggy pants that might get caught up in the bike — go for shorts or something fitted. They’ll give you clip-in spin shoes when you get there. When you walk in, an actual human will check you in at the front desk your first time. (Once you’re in the system and have been to a class before, you’ll just do a quick check-in on an iPad they have set up at the front). The instructor working at the desk will greet you and explain how everything works. One thing we really liked — your shoes (in the correct size) are already waiting for you in a cubby that corresponds to your bike number. It’s a great touch and saves you time scouring for the right size. Plus it just feels really welcoming. You’ll find a pretty big and spacious locker room (unisex – so it’s mostly just for getting your shoes on and off!) and some small combination lockers right outside the studio. There are also single person bathrooms, which is great — nothing worse than riding with a full bladder. You’ll also probably see a small shop with athletic gear and apparel somewhere in the lobby. A lot of it is REALLY nice stuff that’s branded with the Flywheel logo, including a few pieces made by Lululemon. One thing we noticed right off the bat was how clean and tidy the whole place was, which was really impressive! But for now, we’re just here to talk about spin. Before you know it, it’s time to ride! So what’s a Flywheel class actually like? Once you’re clipped into the bike and the instructor takes their place at the front, the lights go down and things start to ramp up. Music: Expect a lot of upbeat pop and hip-hop; general Top 40 sort of stuff. The energy was great but the music wasn’t particularly memorable. Intensity: Like most spin classes, you’ll get a little bit of everything here. After a warm-up song to get loose, you’ll alternate between hill climbs (high resistance) and speed sprints. We found that Flywheel, or at least this instructor, put us through a lot of sprints and not as many hills which was a little different from other classes we’ve taken. Arms: Much like CycleBar, Flywheel kicks things up a notch by including a song or so worth of arm work. How? Attached to your bike you’ll find a 2-pound bar and a 4-pound bar (or combine both for 6 pounds). You’ll get a killer burn in your upper body from these while you ride, although if you have a strong upper body, you might be left wanting more of a challenge. Scoring: Ah, the fun part! Flywheel has a big “scoreboard” at the front (called the TorqBoard) that ranks everyone in the class in real-time based on their performance. Your Torq score is basically a combination of your average RPM and average gear, or in other words, how hard you’re working. On your bike, you’ll have your own live read-out of your Torq score so you can easily see it and adjust your effort level, though we found the placement of the display on the bike a little bit awkward. All in all, my wife reports she burned about 371 calories during her 45-minute ride. When all is said and done, you’ll have gotten a great workout (and you’ll probably be drenched in sweat). Time to get unclipped and hit the locker room. Again, if you just want to slip your shoes back on and head home, there’s a unisex locker room area where you can sit down for a second and collect yourself. There are also private showers and bathroom areas for anyone who needs to clean up immediately (so, yes, Flywheel would make a great pre-work or lunchbreak workout). If you really loved the Flywheel experience, you do have the option of bringing it home with you. You can actually buy Flywheel bikes and get their Peloton-style apps for a full spin experience in your living room, which is pretty cool if you can afford it! You can also buy individual class credits (not limited to a single month) starting at around $23 per class, with bigger packages offering better rates. PLUS, you can spring for memberships that are valid at multiple studios in your area, or even ALL Flywheel studios nationwide (for an extra fee, of course). 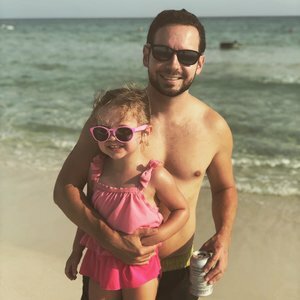 Flywheel definitely isn’t a cheap option, but it’s really cool how many different packages you can mix and match — if you like it, you’re bound to find something that works for you. And if you’re into barre workouts, $200 for unlimited everything at one studio isn’t a bad deal at all. OK, so ultimately, what did we like about working out at Flywheel? That said, there were a few things it felt like Flywheel could improve on, or a few things that make it not the best fit for everyone. Bikes were a little awkward and outdated: The clip style was unusual, and the placement of the screen and water bottle threw us off. 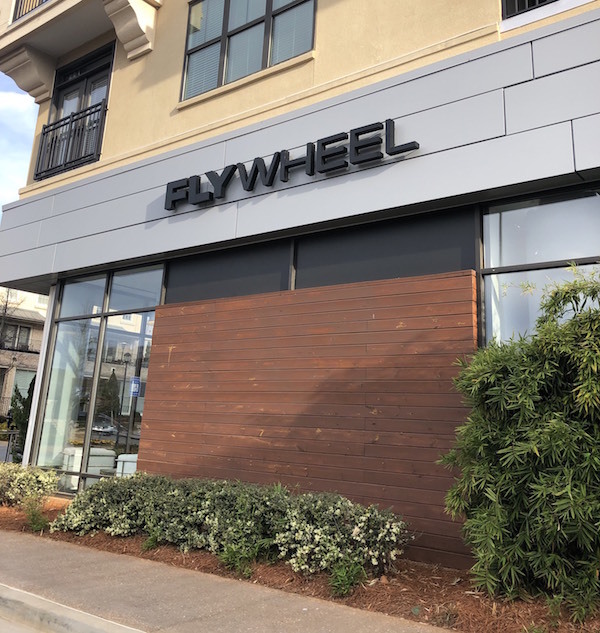 Flywheel is popping up everywhere, and chances are your city or town has a few within shouting distance. It’s a great workout, and even better if you want to check out some of the barre classes they offer on-site. However, Flywheel isn’t our favorite spin experience of all time (that would be CycleBar). Ultimately, we left feeling like it was missing that tight-knit community feel where all the riders and instructors know each other. But it is extremely convenient and well-kept, so if you’re looking for an awesome calorie burn before work or on your lunch break, you could do a lot worse than Flywheel!